The Murray Sheep Handler was invented by Neil Murray in Beverly the mid 1980’s to make handling sheep easier. Neil started with a ‘Vee’ type conveyor that he had to force the sheep into so he came up with the idea to lift the sheep off the ground to immobilize them ready for the tasks required. Neil handed the manufacturing to DE Engineers Founder at the time (Des Prater) who redeveloped the machine so it was lower to be more mobile and sold more than 80 machines within a couple of years but manufacturing stopped in 1990 when DE Engineers concentrated on grain storage and handling. 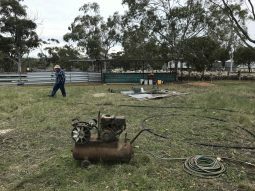 In recent times with an insurgence of interest in sheep handling and in particular requests for the Murray Sheep Handler we have re-commenced production on a new model with only slight modifications to meet current customer expectations. 30 year old machine still working, fast to load & unload. Flipping over a sheep in the race to check feet. 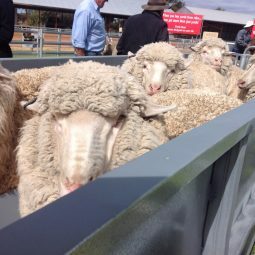 The Murray Sheep Handler is a double race that sheep tend to race along side by side to effortlessly fill the machine with the heads over the backs of the sheep in front so they can’t pull away from the operator. Both sides of the race are easily reached by the operator from one side for faster operation. 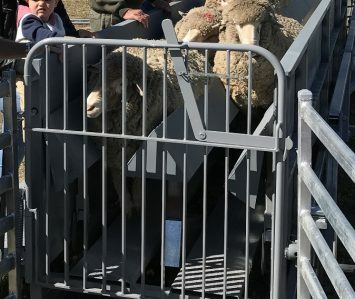 The sheep are lifted comfortably by the sides so there is no chance that valuable rams might be hurt by tripping over bars or chains and prevents the animal from turning around in the race so all animals are in the right direction for unloading. The Murray Sheep Handler can be installed in-ground or can be completely mobile with removable wheels and tow hitch for easy transport. When the sheep are lowered, their feet gently touch the walkway allowing them to run out of the race unhindered by bars or chains. 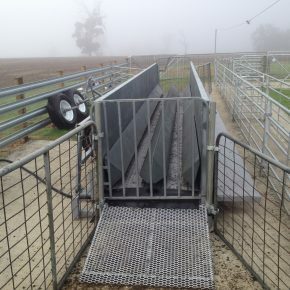 With nearly twice the length of other machines, the Murray Sheep Handler is faster to load and operate, is air operated with very low pressure required. 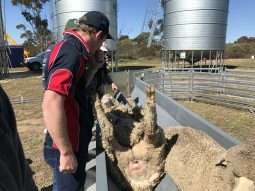 The Murray Sheep Handler is 8m long and one operator can easily Drench, Back-line, Wool-class, Inoculate & Ear tag around 300 sheep per hour (600 with two men). Grinding & checking teeth is made easy, even Toe clipping can be done by slowing the sheep down and loading half a dozen at a time and rolling the animal onto it’s back inside the race nb/-a pillow behind their head will stop the animal kicking. A bugle into the machine is a good idea as is letting the sheep run into a holding pen when they leave the race. By doing the sheep will fill the race by themselves. Also, any race should be pointed away from the shearing shed. A small 3 cubic foot air compressor easily operates the lifting of 20 sheep though a reservoir of air is needed to fill the tire fast enough. A small air tank with a 20mm outlet will suffice or as in this picture: 35m of 25mm poly works perfectly. NB/- make sure the air compressor is a good distance from the handler so the noise doesn’t spook the sheep. Drop in the lamb cradles to reduce the ‘Vee’ width to accommodate lambs.